Image credit: Sandra Plummer Collection at the Fort Worth Library's Digital Archive. Colorized courtesy of Algorithmia. From the so-called “Historical Data1” for Batangas City that was researched, written and submitted in the early 1950s by the Department of Education District of Batangas as required by the administration of President Elpidio Quirino, we get accounts of three different events that supposedly happened in the then-town of Batangas late in the 19th century. As with other “historical data” not just for Batangas but other parts of the country as well, the information contained in the documents was written sometimes with very poor research or transcribed from the recollections of the elderly. Very few contain citations – if at all – which therefore makes the information difficult if not impossible to corroborate from other sources. Still, the events contained in this article cannot be dismissed especially in light of the fact that literature about the Philippine Revolution in Batangas late in the 19th century is very scarce. Also, these stories were likely written down from the recollections of old people; and the fact that they are difficult to corroborate does not necessarily mean they are not historical. In 1896, during the governorship of one Manuel Sapata, suspected Katipunan sympathizers were rounded up by Spanish authorities in the town of Batangas. Many readers will recall that 1896 was the year when the Philippine Revolution against Spanish rule finally broke out after brewing for some years in the underground. The use of the word “governorship” was likely in reference to the “gobernadorcillo,” a position within a municipality which “combined charges or responsibilities of leadership, economic, and judicial administration2.” Besides, the Provincial Governors at the time were Don Leandro Villamil, who was dismissed; and Don Emilio Sampedro Uria, who took over from the fomer3. The rest of the Katipunan sympathizers, numbering about 100, were taken to the Bilibid Prison or the “Carcel y Presidio Correccional” at the Mayhalique Estate in Manila. The facility is presently referred to as the “Old Bilibid Prison6.” Presumably, some of these participated in the jailbreak on the 3rd of May 1897 when the prison guards were rushed and their guns taken. Among those who were left behind and were put to death by prison administrators was one Lauro de Marquez, who was supposedly anti–Catholic. Unfortunately, the source document failed to state if he was among the Katipunan Sympathizers rounded up in the town of Batangas. In 1898, the Spanish Army in Batangas according to the source document was “on the verge of collapse.” By “Spanish Army,” the document likely meant the Guardia Civil, which was “organized as a military force charged with police duties7.” The reader has to understand that the “Spanish” Guardia Civil also had among its ranks native Filipinos. At any rate, according to the source document, the remaining Spanish forces along with their families assembled in the convent (church) in the belief that the revolutionaries would “respect the place.” This belief likely stemmed from the Medieval European principle of church sanctuary, a practice whereby fugitives were immune from arrest if inside the premises of a church8. 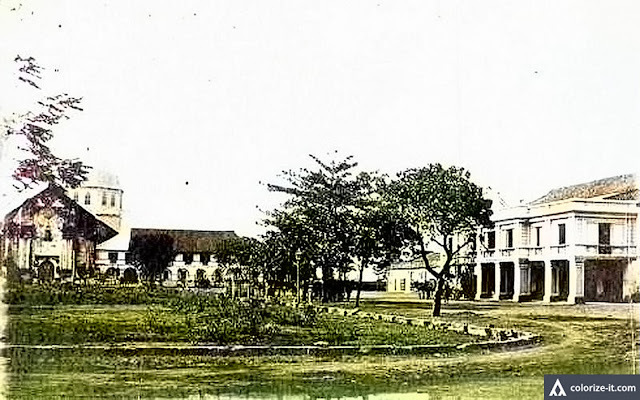 Filipino revolutionary forces under the command of General Eleuterio Marasigan of Calaca, however, were positioned at the plaza directly in front of the convent. After a tense standoff, the nuns in the convent and the wives of the Spanish forces pleaded with the officers of the Guardia Civil to surrender. Seeing that their position was untenable, they raised the white flag to put to an end “the Spanish tyranny and oppression in Batangas” in May of 1898. 1 “History of the Poblacion (Batangas City),” online at the National Library of the Philippines Digital Collections. 3 “Chronological List of Alalde-Mayores, Govenors and Other Officials, Indicating Their Terms of Offic in Batangas Province,” compiled by Jigger Gilera MD, online at the Facebook Group History of Batangas. 5 “Symbols of The State Republic of The Philippines,” published 1975 by the Bureau of Local Government, Republic of the Philippines. 6 “New Bilibid Prison,” Wikipedia. 7 “Civil Guard (Spain),” Wikipedia. 9 While there are, indeed, references to a General Brigido Buenafe within the context of the Philippine Revolution over the Internet, the author of this article is unable to corroborate that he was appointed alcalde-mayor of Batangas town during the short-lived republic under the Presidency of Emilio Aguinaldo.